Somehow Americans have acquired the notion that flower gardens and vegetable gardens should be two separate entities. 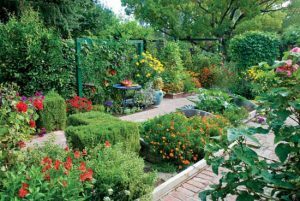 “Not only can you put flowers in with vegetables, you should,” says landscape designer Rosalind Creasy in an article for Mother Earth News. Creasy first got the idea to plant flowers around her front yard vegetable garden 1970s. The idea was to “hide” the vegetables so her suburban neighbors wouldn’t notice them or complain. Soon, she discovered the flowers served more than just an aesthetic purpose. She had fewer pest problems, more birds, and her crops were thriving. 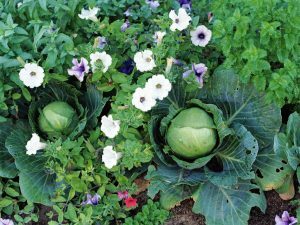 “It turns out that flowers are an essential ingredient in establishing a healthy garden because they attract beneficial insects and birds, which control pests and pollinate crops,” Creasy writes. Many of our native prairies and wild flowers have disappeared under acres of lawn and monocrops, leaving fewer food sources for beneficial garden critters, she notes. Planting chemical free native flowers provides bees and other pollinators safe haven in your garden. In exchange, they offer other beneficial insects pollen and nectar so they’ll stick around and ward off pests. Flowers also act as a physical barrier — as opposed to a chemical barrier — to pests. “The hornworms on your tomato plant, for instance, won’t readily migrate to a neighboring tomato plant if there’s a tall, “stinky” marigold blocking the way, Creasy says. The more diverse range of flowers you offer, the more diverse the population of beneficial insects you’ll attract. Creasy suggests mixing a few plants from the daisy family — such as black-eyed Susans, coneflowers, cosmos, marigolds, sunflowers and zinnias; the parsley family — especially carrots, cilantro, dill and parsley; the mustard family — including nasturtiums and sweet alyssum; and the mint family —basil, sage, Victoria salvia and mint. For a comprehensive list, see The Best Plants to Attract Beneficial Insects and Bees. 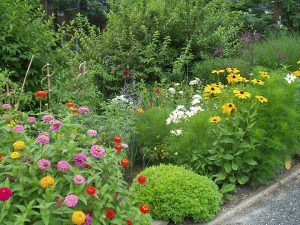 Creasy also suggests choosing flowers native to your region to attract the insects and birds vital to your ecosystem, so seek out native plants. Try to find heirloom varieties, as they’re often packed with nectar and pollen. For more flower choices, see 10 of the Best Flowers to Plant with Vegetables.